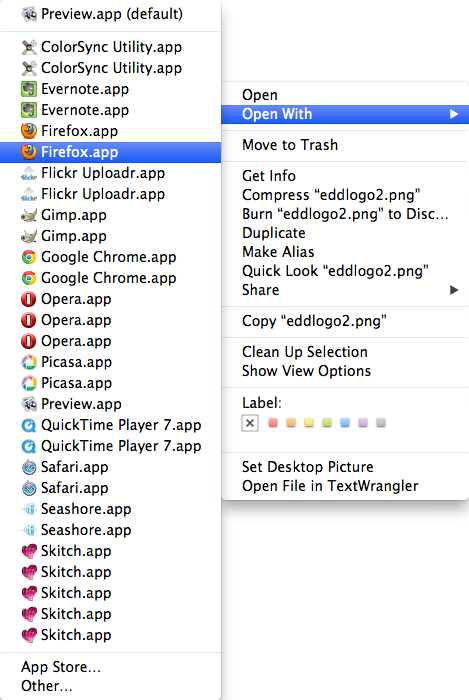 When I right-click on a file on my Mac OS desktop and then in the contextual menu, I move to the "Open with...", the list of potential applications to "open with" has applications listed multiple times, sometimes three or four times, right next to each other! how do I stop it from re-occurring? Now I have Mountain Lion on a 13" MacBook Pro, but this problem existed before I upgraded to Mountain Lion. This happens because the LaunchServices database gets corrupted. Open Terminal.app in the /Applications/Utilities/ folder. This command has changed over the years, but I just recently ran the above to fix the same issue on Mountain Lion. This hint on Mac OS X Hints covers the command for other Mac OS versions over the years. If you don't like using the command line, the free tool Onyx also has an option under Maintenance -> Rebuild -> launchservices will work too. As for how to stop it, I really haven't ever seen a way. I am not sure what actually causes it to corrupt other than I know it is very actively used. I would use Spotlight or Finder to search for, let's say, "Skitch" and try and see if possibly there are multiple versions that may have been accidentally copied or duplicated to somewhere else on your Mac. If not that, then maybe they're each different versions, and the old versions haven't been deleted. But I highly doubt it's the latter, most likely the former. Not the answer you're looking for? Browse other questions tagged mountain-lion finder desktop . Where is the preference list for “open with” applications? Why does Xcode open when I start OS X? How can I change the list of “Open With” applications?